Samaria Residents' Committee calls on advertisers to pull advertisements from Haaretz for hate-filled incitement against religious Zionists. The Samaria Residents' Committee is launching a new initiative and calling on businesses not to publish ads in the Haaretz newspaper on Tuesdays in May, following the newspaper's publishing of an op-ed declaring the religious Zionist community to be 'worse than Hezbollah.' The op-ed originally was titled "Worse than Hezbollah" but that was changed to a lesser insult and included a sentence saying that while Hezbollah can be murdered - later changed to "neutralized" - Religious Zionists can't be. In a letter to the businesses which advertise in Haaretz, Samaria Residents' Committee chairman Shai Dickstein wrote: "In recent days, another red line has been crossed in the false and wild incitement by the Haaretz newspaper." Dickstein called on the newspaper's subscribers and advertisers to declare that "we will not be partners in the livelihood of hate-filled instigators, who sow discord and lies." "The blasphemous words of Yossi Klein crossed a red line, and [Haaretz] publisher Amos Schocken added insult to injury when he came out to support him," Dickstein said, referring to the publisher's many interviews on Israeli media after the article was published. 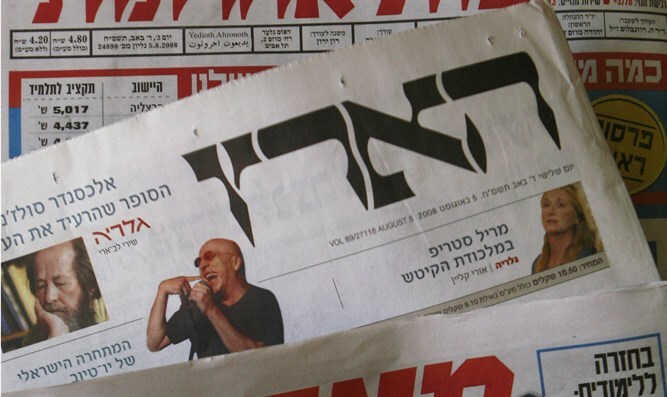 Dickstein added that he hoped the economic pressure on Haaretz would cause the newspaper to cease its hatred and incitement against Israel's religious Zionist community.